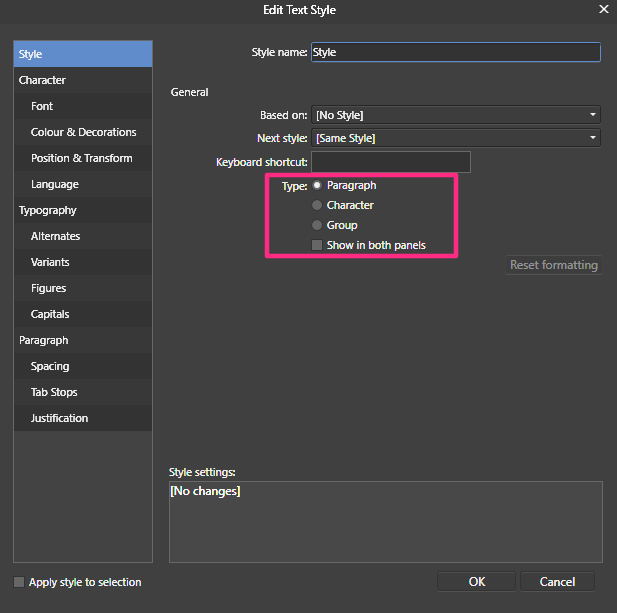 If you create text style Text > Text Styles > Create Paragraph Style or Text > Text Styles > Create Character Style it brings up a menu window called "Edit Text Styles". It is the same menu, offers the same choices and can be made into Character or Paragraph Styles. All the two Text menu choices (above) do is set the base setting in Edit Text Styles. I think. Considering how mean Serif can be putting menu options in menus (Like a nest command) why lavish so much menu space on text styles? Personally I nest layers far more often than I create text styles.